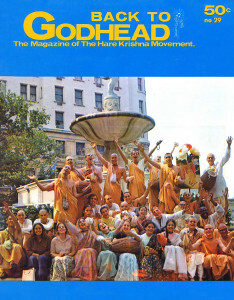 Back to Godhead > ISKCON > What is The International Society for Krishna Consciousness? Krishna Consciousness is experienced as a process of self purification. Its means and end are an open secret, and there is no financial charge for learning Krishna Consciousness or receiving initiation into the chanting of Hare Krishna. The gist of devotional service to Krishna is that one takes whatever capacity or talent he or she has and dovetails it with the interests of the Supreme Enjoyer, the Lord, Sri Krishna. The writer writes articles for Krishna, and we publish periodicals in this way. The businessman does business in order to establish many temples across the country. The householders raise children in the science of God, and husband and wife live in mutual cooperation for spiritual progress. These activities are done under the sanction of the expert Spiritual Master, and in line with the Scriptures. Devotional service in Krishna Consciousness means regular chanting in the temple, hearing talks about the Pastimes of Krishna from Srimad Bhagwatam, and taking foodstuffs prepared for and offered to the Supreme Personality of Godhead. By books, literature and records, the Society is dedicated to awakening the worldwide public to the normal, ecstatic state of Krishna Consciousness, so that all may regain their eternal position of favorably serving the will of Krishna. Sankirtan—congregational chanting—is carried to the people: in public parks, schools, on t.v., in the theater, on the streets. Krishna Consciousness is not an idler’s philosophy. Rather by chanting and by engagement in the service of Krishna, anyone who takes part will experience the state of “Samadhi, ” ecstatic absorption in God-consciousness, 24 hours a day!